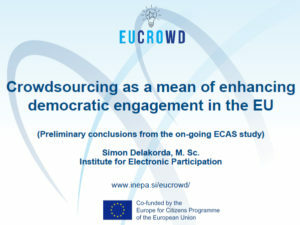 Preliminary conclusions from the European Citizen Action Service ongoing study of citizens crowdsourcing for enhancing democratic engagement in the European Union were presented to the students at the Faculty of social sciences at the University of Ljubljana as a follow up to the international EUCROWD conference. 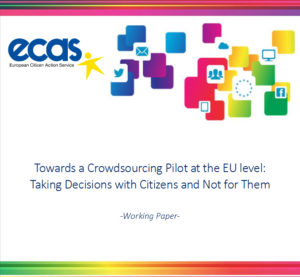 European Citizen Action Service has been researching how to apply the crowdsourcing method as a complementary tool to existing frameworks in order to expand the number of contributors to EU policy-making, remove potential barriers to participation and “engage the unengaged” throughout Europe. This has been done by assessing 27 national case studies of crowdsourcing worldwide in order to examine if the EU can benefit from the lessons learnt in this field.